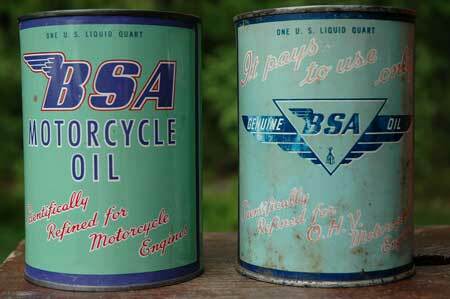 Genuine BSA Motorcycle Oil. 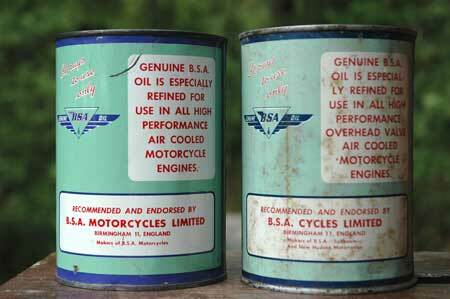 The can to the right dates to pre-1958 as it's marked "BSA Cycles." When BSA sold its bicycle manufacturing to Raleigh in 1958, it changed its name to "BSA Motorcycles." Also, the older can notes BSA are the maker of BSA, Sunbeam, and New Hudson — the latter two vanished in 1957. The newer can contains SAE10 oil, the older is 10W10. Ted Hodgdon, late president of BSA East (USA) told us, "the stuff (BSA oil) was crap." 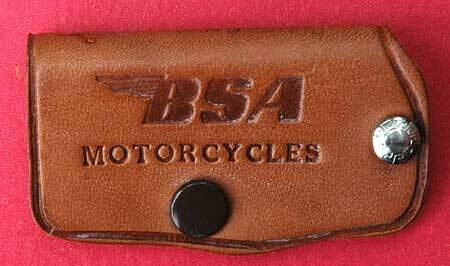 BSA Leather Key Case. The writing on the back reads, "RIDE CAREFULLY. 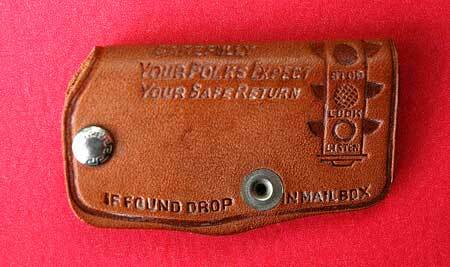 YOUR FOLKS EXPECT YOUR SAFE RETURN. IF FOUND, DROP IN ANY MAILBOX." 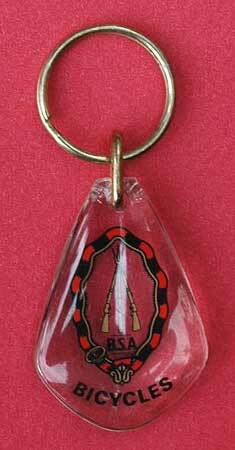 BSA Bicycles Key Fob. This was given to Bill Litant in 1980 at the Raleigh factory in Nottingham. At the time, they were still making BSA bicycles — actually Raleighs badged as BSAs. 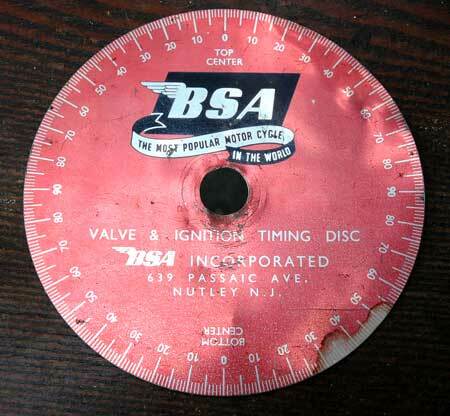 BSA Timing Disk. Made for Eastern U.S. BSA. 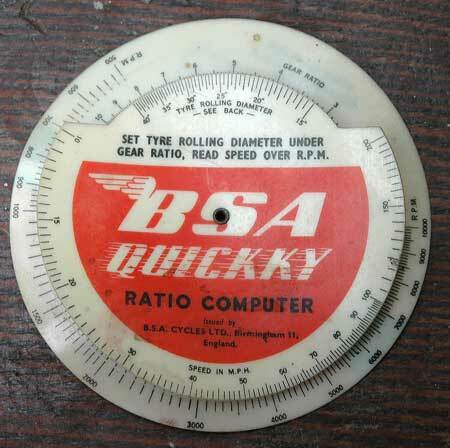 BSA Quickky Ratio Computer. Turn the inner wheel to match tire diameter with gear ratio. You can then match RPM with vehicle speed. Plastic. BSA Lapel Pin. 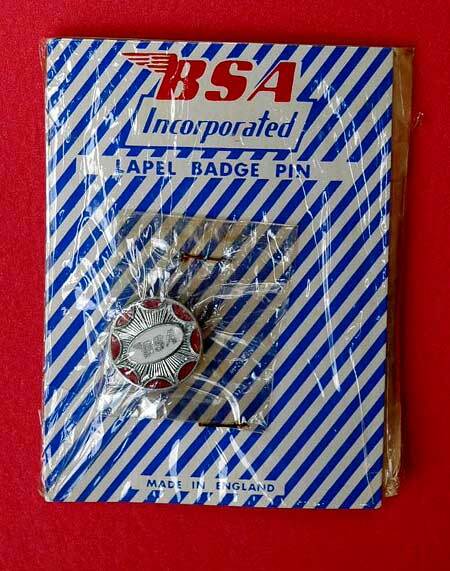 You can still get the pins, but you can't get them in the official BSA packaging. This likely dates to the late 1960s.